I’m not what you’d call the world’s biggest Star Wars fan. I love the original trilogy and all, but aside from a couple of video games, I never delved any deeper into the lore or the so-called “expanded universe,” and after the debacle of the prequel trilogy, I decided that Star Wars was dead to me. My favorite thing about Star Wars – more so than light sabers or Jedi or Darth Vader – was the space combat. Space dogfighting makes no sense, but it’s awesome and it also makes the PC games X-Wing and TIE Fighter the best things to come out of Star Wars media. 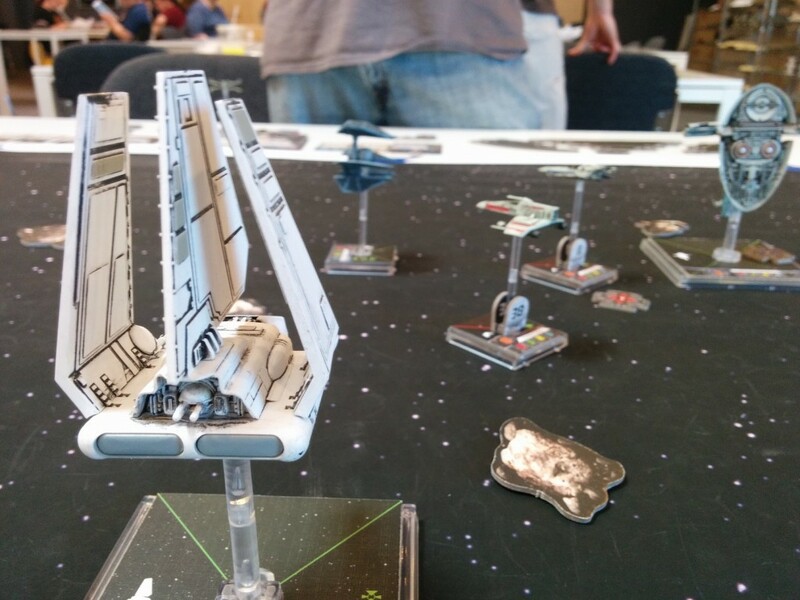 When Fantasy Flight Games released their X-Wing Miniatures Game two years ago, I didn’t pay much attention, but I should’ve known I would get sucked in eventually. It’s essentially Space Dogfight: The Game, and with my love of the PC games combined with my tabletop game renaissance, playing the game was almost a foregone conclusion. I spent many hours of my youth playing other miniatures games like Warhammer 40,000 , and while X-Wing bears some similarities to that granddaddy of the genre, it is better in many ways while also being difficult to directly compare. X-Wing is a much faster game; a typical session is 60-90 minutes, while Warhammer is usually a multi-hour affair. This is largely a function of the smaller size of the game – the photo above shows all of the models on both sides during that game, compared to Warhammer which might feature a hundred or more models in a single battle. Like in Warhammer, X-Wing has a squad-building component, where you select your force composition before battle, which is probably half the fun of the game. What’s becoming my favorite part of the game, though, is the mind game of choosing each of your ship’s maneuvers and trying to intuit what the opponent will choose. You see, each of your ships has a dial that is used to select its move for the turn, and these dials are placed face down on the board, only to be revealed when that ship comes up in the turn order. You have to choose your move without knowing what the opponent will do, and so you need a good grasp of the game state, each ship’s capabilities, and the mind of your opponent in order to win. Yomi is the Japanese word reading, as in reading the mind of the opponent. If you can condition your enemy to act in a certain way, you can then use his own instincts against him (a concept from the martial art of Judo). Paramount in the design of competitive games is the guarantee to the player that if he knows what his enemy will do, there is some way to counter it. What happens, though, when your enemy knows that you know what he will do? He needs a way to counter you. He’s said to be on another level than you, or another “Yomi Layer.” You knew what he would do (yomi), but he knew that you knew (Yomi Layer 2). What happens when you know that he knows that you know what he will do (Yomi Layer 3)? You’ll need a way to counter his counter. And what happens when he knows that you know…. It’s this sort of recursive thought process that happens during maneuver selection in X-Wing (at least, among people who have played enough to be familiar with the game and the moves available). Actually, the game may not meet Sirlin’s criterion of three “yomi layers,” since there are often situations where each ship has a limited number of viable moves, and despite knowing with high confidence what the opponent will do, you may not have a counter-move available. At first, this aspect of the game wasn’t apparent to me, as all I worried about was avoiding ramming my ships into asteroids and each other. Move selection at the outset, then, was mostly about just making the game work on a basic level. But as I’ve become more experienced, I’m better able to “see” the battlefield, and visualize both my own moves and those of the opponent. All told, the game is a worthy addition to the space dogfight heritage of Star Wars, but more importantly, it’s a good game on its own merits, not just for being able to repeatedly make groan-inducing quips from the movies (“they came…from…behind…!”). I couldn’t leave a reply on the post that I was actually reading, so I will leave this here. Not even sure if you are still writing, but I’ll take the chance that you’ll see this somehow. Anyways, thank you – It is a relief in a way knowing I am not the only one stressing about it this much – and to the extent that I am.